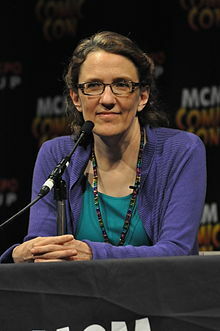 Jane Espenson (born July 14, 1964) is an American television writer and producer. Espenson has worked on both situation comedies and serial dramas. She had a five-year stint as a writer and producer on Buffy the Vampire Slayer and shared a Hugo Award for her writing on the episode "Conversations with Dead People." From 2006–2010, Espenson had worked on Battlestar Galactica and many of its supplementary works. Between 2009–2010 she served on Caprica, as co-executive and executive producer for the television series. In 2010 she wrote an episode of HBO's Game of Thrones, and joined the writing staff for the fourth season of the British television program Torchwood, which aired on BBC One in the United Kingdom and Starz in the United States during mid-2011. She was working as a consulting producer and writer on ABC's series Once Upon a Time, and has co-written and produced her first independent original web series with co-creator Brad Bell, entitled Husbands. Espenson grew up in Ames, Iowa and graduated from Ames High School. As a teenager, Espenson found out that M*A*S*H accepted spec scripts without promise of payment or future work. Though she wasn't an established writer at the time, she planned to write her first episode. She recalls, "It was a disaster. I never sent it. I didn't know the correct format. I didn't know the address of where to send it, and then I thought, they can't really hire me until I finish junior high anyway." While Espenson was studying computer science and linguistics as a graduate student at University of California, Berkeley, she submitted several spec scripts for Star Trek: The Next Generation as part of a script submission program open to amateur writers; Espenson has referred to the program as the "last open door of show business". Her next break was in 1992 with a spot in the Disney Writing Fellowship, which led to work on a number of sitcoms, including ABC's comedy Dinosaurs and Touchstone Television's short-lived Monty. In 1997 she joined the staff of Ellen as a writer and producer. After a year, Espenson decided to switch from comedic to dramatic writing and applied for a position at Buffy the Vampire Slayer. In 1998, Espenson joined Mutant Enemy Productions as executive story editor for the third season of Buffy the Vampire Slayer. Espenson wrote or co-wrote twenty-three episodes, starting with "Band Candy" and ending with Buffy's penultimate episode, "End of Days." After her role as an Executive Story Editor, she was promoted to a Co-Producer in season four. In the fifth season she was promoted again to a producer. She took up the role of supervising producer in the sixth season and was promoted once more to a co-executive producer in the final season. She wrote episodes both humorous (e.g. "Triangle" and "Intervention") and serious (such as "After Life"). Espenson and Drew Goddard co-wrote the seventh-season episode "Conversations with Dead People," for which they won the Hugo Award for Best Short Dramatic Presentation in 2003. She also co-/wrote several comic book stories for Tales of the Slayers, Tales of the Vampires and Buffy the Vampire Slayer Season Eight, the one-shots Jonathan and Reunion and the limited series Haunted. Espenson joined the crew of Sci Fi's Battlestar Galactica (BSG) just after Battlestar Galactica: Razor, BSG's first television movie, was conceived. As one of BSG's co-executive producers, she worked on every fourth-season episode starting with "He That Believeth in Me"; she was also the writer of "Escape Velocity" and "The Hub" and co-wrote The Face of the Enemy webisodes. Prior to joining the show's staff she wrote one third-season episode and co-wrote another. In August 2008, the Los Angeles Times broke the news that Espenson was the writer behind BSG's second television movie, The Plan, news confirmed in her writer's blog. In January 2009 it was announced that she had joined the spin-off series Caprica as co-executive producer and would take on showrunner duties midway through the first season. Espenson later gave up showrunning duties to focus more on writing. In August 2010 it was announced that Torchwood creator, lead writer and executive producer Russell T. Davies had hired Espenson to write for the show's fourth series, Torchwood: Miracle Day to be broadcast in 2011. She later confirmed that she would be writing episodes 3, 5, 7 and co-writing episode 8 (with Ryan Scott) and episode 10 (with Davies). Prior to her involvement with Torchwood, Espenson had said she was a fan of the show, particularly the third series, "Children of Earth." To tie in with the launch of Torchwood: Miracle Day, Espenson and Scott collaborated on the Starz-produced 2011 Torchwood webseries entitled Torchwood: Web of Lies, which stars American actress Eliza Dushku. Following the broadcast of each episode of "Miracle Day" on Starz, Espenson wrote a blog on AfterElton mixing her reaction to the episode with behind the scenes information on the devising process. In January 2011, Entertainment Weekly announced that Espenson and fellow Buffy writer Drew Z. Greenberg would be writing a pilot for Syfy's version of Randall and Hopkirk (Deceased). She told io9 that "The version we're proposing is quite different in tone and content from the original." She added "We took the basic premise of a Ghost Detective and his still-living partner and invented our own take on it." In 2011 she also co-wrote and produced her first independent web series, entitled Husbands, which revolves around the life of two newly married gay men. The series premiered Tuesday September 13, 2011. In May 2011, Espenson was brought on to the ABC fantasy series Once Upon a Time, as a writer and consulting producer. Espenson has written episodes for several other television shows, including episode 4.17 ("Accession") of Star Trek: Deep Space Nine, an episode ("Shindig") of Firefly, an episode ("The Gamble") of The O.C., and two fourth-season episodes of Gilmore Girls. She has also worked on Angel, Tru Calling, The Inside, The Batman, Andy Barker, P.I., Jake in Progress, Dollhouse and was the co-creator of Warehouse 13. Espenson is the editor of Finding Serenity: Anti-Heroes, Lost Shepherds and Space Hookers in Joss Whedon's Firefly (BenBella Books, 2005, ISBN 1-933771-21-6), a collection of non-fiction essays on the short-lived television show Firefly. Espenson has appeared as an "expert witness" in the Judge John Hodgman podcast episode "Science Friction." Espenson studied linguistics as an undergraduate and graduate at University of California, Berkeley. She worked as a cognitive linguistics research assistant for George Lakoff, who acknowledged her work on the metaphorical understanding of event structure in English and credited her with recognizing the existence of the phenomenon of location-object duality in metaphors pairs. Lakoff also mentioned her year-long work on the "metaphorical structure of causation" in the acknowledgments section of Philosophy in the Flesh: The Embodied Mind and Its Challenge to Western Thought (1999, ISBN 0-465-05674-1). 1994 Monty Yes Episode written: "The Principal's Interest"
"Variations on a Theme Park"
1995 Me and the Boys Yes Episode written: "The Age of Reason"
1996 Star Trek: Deep Space Nine Yes Episode written: "Accession"
Nowhere Man Yes Episode written: "Zero Minus Ten"
"Something About a Silver Anniversary"
"Something About Secrets & Rules"
2002 Firefly Yes Episode written: "Shindig"
2003 The O.C. Yes Episode written: "The Gamble"
2005 Tru Calling Yes Yes Episode written: "In the Dark"
2005-2006 Jake in Progress Yes Yes Episode written: "The Two Jakes"
Eureka Yes Episode written: "Family Reunion"
2011 Game of Thrones Yes Episode written: "A Golden Crown"
Torchwood: Web of Lies Yes Episode written: "Missing Day: Part 1"
2003 Hugo Award Best Dramatic Presentation, Short Form "Conversations with Dead People"
^ a b c d Kelly, Suzanne. "Jane Espenson: Writer, sci-fi thriller, one nerdy lady". CNN. Retrieved 28 January 2011. ^ Maureen Ryan (2009-01-23). "'Battlestar Galactica' veterans move on to 'Caprica'". Chicago Tribune. Retrieved 2009-01-23. ^ Zaino, Nick (2010-08-06). "'Buffy', 'Breaking Bad' Writers Join 'Torchwood'". TV Squad. Retrieved 2010-08-06. ^ Espenson, Jane. "I'm writing 3 5 7 and splitting the writing on 8". Verified Twitter Account. Twitter. Retrieved 29 January 2011. ^ "Jane Espenson on Twitter". April 19, 2011. ^ Jensen, Michael (20 January 2011). ""Caprica"'s Jane Espenson: "It's Time For Sexuality to be Incidental"". AfterElton. Retrieved 13 September 2011. ^ Jefferey, Morgan (3 June 2011). "Eliza Dushku confirmed for 'Torchwood' spinoff". Digital Spy. Retrieved 13 July 2011. ^ Espenson, Jane (2011-07-11). "Exclusive! "Jane's Take" Episode One "Torchwood: Miracle Day"". After Elton. Archived from the original on 2011-07-13. Retrieved 2011-07-11. ^ Hibberd, James. "'Buffy' writers to pen Syfy's Brit hit". Entertainment Weekly. Retrieved 30 January 2011. ^ Jane Anders, Charlie. "Jane Espenson tells io9 about bringing Britain's greatest ghost detective to America". io9. Retrieved 30 January 2011. ^ "BIOS — Husbands". Archived from the original on 19 July 2011. Retrieved 28 July 2011. ^ Jane Espenson, Liz Tigelaar Join ABC's "Once Upon a Time". Accessed 16 February 2012. ^ Julia Smith (19 February 2014). "Judge John Hodgman Episode 148: Science Friction". Maximum Fun. Retrieved 2014-05-14. ^ "International Academy of Web Television Announces Nominees for the 2nd Annual IAWTV Awards". IAWTVAwards.org. Retrieved November 13, 2012. ^ "WINNERS: 4th Annual Indie Soap Awards". We Love Soaps. Retrieved February 21, 2013. ^ Nordyke, Kimberly (December 5, 2013). "Writers Guild Awards: 'Breaking Bad,' 'Orange is the New Black' Among TV Nominations". hollywoodreporter.com. Retrieved December 5, 2013. ^ "IAWTV ANNOUNCES 2014 AWARDS NOMINATIONS". iawtv.org. December 13, 2013. Archived from the original on December 14, 2013. Retrieved January 8, 2014. ^ "5th Annual Indie Series Awards Nominees". indieseriesawards.com. Archived from the original on August 6, 2015. Retrieved February 6, 2014. ^ "4th Annual Streamy Awards Nominees". streamys.org. Retrieved August 19, 2014. ^ "Jane Espenson to Receive the 2015 Etheria Film Night Inspiration Award". dreadcentral.org. Retrieved November 13, 2012. Wikimedia Commons has media related to Jane Espenson.